Summary: Why just color? when you can blendy color! Make cool airbrush art! With the blendy, air brushing art is easy to make! Why just color? when you can blendy color! Make cool airbrush art! 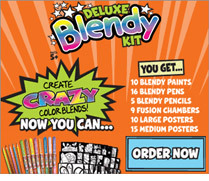 With the blendy, air brushing art is easy to make! Easily switch out colors and your kids will love playing with it!